We are Taste the Cracklin hog roast caterers, and it’s always fun catering around Winslow. Winslow is a small market town. Notable buildings are Winslow Hall, which was possibly based on designs by Sir Christopher Wren, and the Church of England parish church in High Street, which dates from around 1320. It is dedicated to St Laurence, and is twinned with St Paul’s Church in Winslow, Arizona. Lastly, the half-timbered Bell Hotel was first recorded in the late 16th Century and was Winslow’s main hostelry at around that time. Local traditions include the Whaddon Chase fox hunt, which traditionally met in the Town Square at Winslow every Boxing Day. The occasion is very well attended, and Christmas Carols are played. Other annual events in Winslow include the March beer festival and The Winslow Show, which is a gymkhana and agricultural show held in August. Our team offers catering, which as standard includes decorations, condiments and bread rolls, and for those who like to be more hands on, we provide hog roast machine hire, where you can hire the very same machines we use to cater for events. If you’re looking for something different to the usual catering options, our roasts are delicious and come with crackling and apple sauce; we’re the team for you! We’re getting a lot of orders for Hogmanay and New Year’s parties, and of course there are all the usual birthday parties, corporate events and weddings to cater for too. We’re always busy here at Taste the Cracklin! It is fun, though. Christmas was a very busy time for us, and surprising as it may sound, it is actually fun catering parties and dinners. It’s getting to see the enjoyment and great service you’re giving people, seeing them enjoy the food you spent so long preparing, seeing them smile and have a great night. Christmas is all about being merry, right? When you can provide that, when you can be someone’s Christmas, it makes you feel pretty good. Over the festive period we have catered for Christmas parties in top hotels as for parties in pubs, dinners in community centres…you name it, we’ve seen it. On Christmas Eve we delivered a hog roast machine to a group of friends who were having a house party (which by the looks of the place when we returned to pick up the machine had spilled out of the house and become a garden party – thank God for patio heaters, eh?). 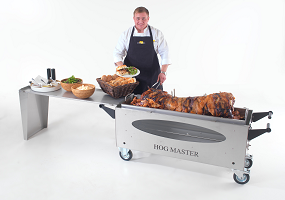 A few days later, we delivered another hog roast machine for a party in a small hotel in the town. They had wanted the party on Christmas Eve, the lady told us, but she had to go visit her family that day. I was under the impression that she didn’t really like her family (I know a lot of people who don’t, and therefore regard Christmas a bit of a chore), until I realised they were invited to the party. Her friends kept looking at the machine and a young teenage girl kept wanting for a go at working the machine; she said it was “cool”. Our client explained this was her daughter who was 12 and loved machines. The girl seemed a bit disappointed when a member of my team explained that the machine does not require constant operation and just turns by itself. Our team checked that the machine was working, as we always do, and then we were off to do two more deliveries to a pub and a community centre. A couple hours later, we went back to pick up the machine, and the client said it had been lots of fun and everyone had enjoyed the food, especially the hog roast. “None of us had ever tried it before,” she said. Her mum came out and thanked us, too. We drove away in pretty good spirits. We also catered for an engagement party on the other side of Winslow – which made a change from all the Christmas events. We put up balloons and set out serviettes, bread rolls and condiments. Soon the roast turning in the machine and glistening under the lights. Its delicious, slightly spicy scent wafted in my direction. The guests began to arrive and after a while it was time to carve and serve the roast, which was now dripping with apple sauce. Everyone enjoyed themselves, and that’s what makes it all worthwhile.